A couple of weeks ago, I was presenting to the marketing team of a large European company that was visiting Silicon Valley to better understand the impact of technology on their business. As I was preparing, I looked up their Twitter account: 41.7K followers. Then I looked up their LinkedIn followers: 63k. Facebook fans: 151.2k. Finally I checked their headcount in Wikipedia: 150,000 employees. 150,000 employees vs 250,000 followers. Even if these employees were to have only 200 social connections (the average on Facebook alone is 338), the cumulative reach of the company’s employees dwarves the corporate marketing one. 30M to 250k. That’s 120 to 1. Think these are the metrics of an old-fashioned, obsolete company that don’t apply to your company? Let’s do the math. Suppose your company’s headcount is 100. Do you have 20k followers? Or say your company employs 10 people. Do you have 2,000? Things get even bleaker when you consider this: the organic reach of brands on social networks is dramatically lower than that of individuals. Facebook dropped a bombshell when they admitted this, yet explained that they had no choice. Since all social networks derive advertising revenue from brands (as opposed to individuals), this trend is not going away any time soon. So when it comes to reach, employees beat brands not just by the numbers but also from a qualitative standpoint. Why the hell don’t my co-workers share any of my content? In our recent analysis of 1,000+ SMB marketers content marketing practices, we found that only 20% of them managed to get their colleagues to share their content on a regular basis. Because people outside of marketing are focused on their own jobs and simply don’t have the time. Sure, it would probably benefit their personal brand and help to improve their customer credibility. Most of the time, they reap the benefits for themselves and the company. But the reality is that people are busy creatures, and they ultimately end up forgetting about it. 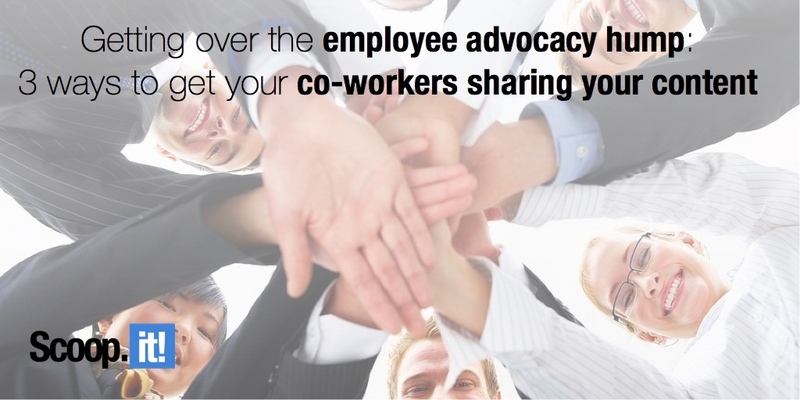 To solve the problem of employee advocacy, you need to make things dead simple. 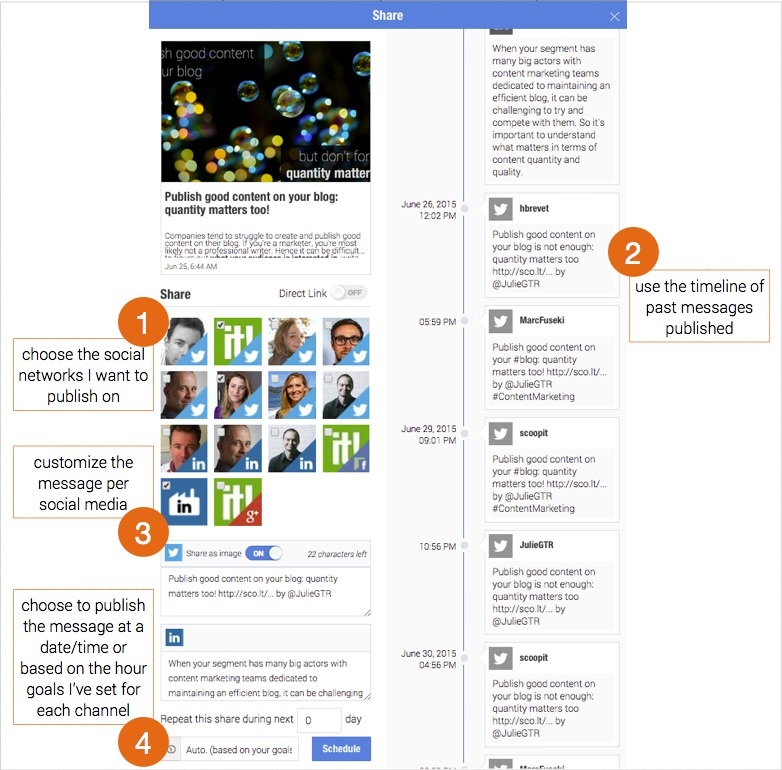 To get more of your colleagues participating in your content marketing efforts, the most straightforward strategy is to have them delegate their own social channels to you. This takes a certain level of trust, but the benefit is that you’ll never have to complain again about them not pulling their weight. The catch is… now you have to do it yourself! Luckily, you can automate the process by using smart social media publishing tools that have collaboration features and allow you to add as many social accounts as you’d like. Pick your favorite one. Ours – as you may have guessed – is our own Scoop.it Content Director. Once you’ve added your co-workers as contributors in Scoop.it Content Director, simply ask them to add their social accounts as a destination (this includes Twitter, LinkedIn, Google+, Pinterest, etc.). Once a social account is added, it will appear on the left-hand side of the calendar as a distribution channel (like Guillaume’s Twitter profile in the screenshot above). 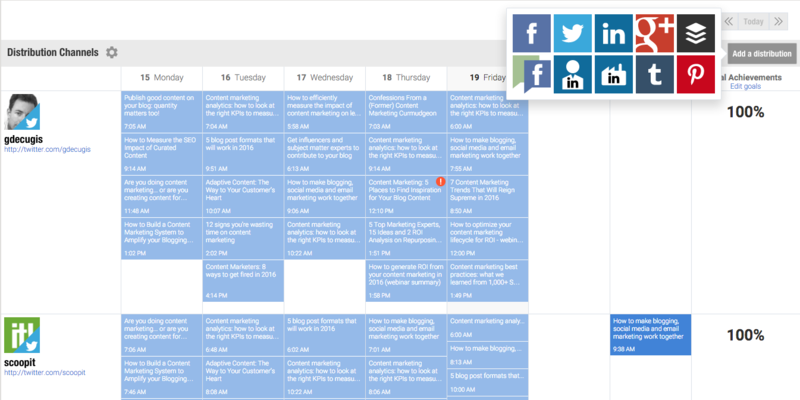 The social accounts of contributors will show up on the calendar and on the timeline of each post so you can easily tell how many people are sharing the post at a given time and avoid oversharing and spamming their followers. While you probably won’t get 200 people to delegate sharing in this way, there are alternative methods for dealing with larger groups or with those who may need a bit more convincing. 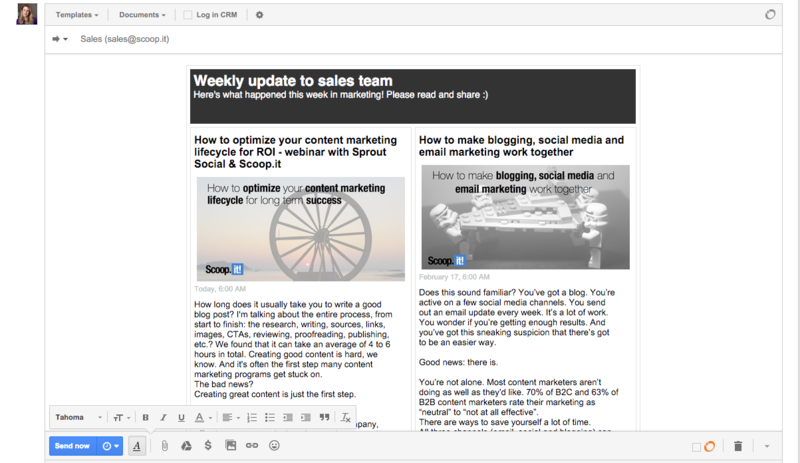 You’d think this would be simple: the content you want your teammates to share is on your company’s blog. All they have to do is go to the blog and click share. Wouldn’t it be great if people actually did this? The reason being because it’s not dead simple. They have to go through the hassle of even thinking of going to the blog first. Why would they? To minimize the perceived effort on their end of having to go ALL the way to the company blog in order to share your content, make things easier for them by getting your content directly to their email inbox. 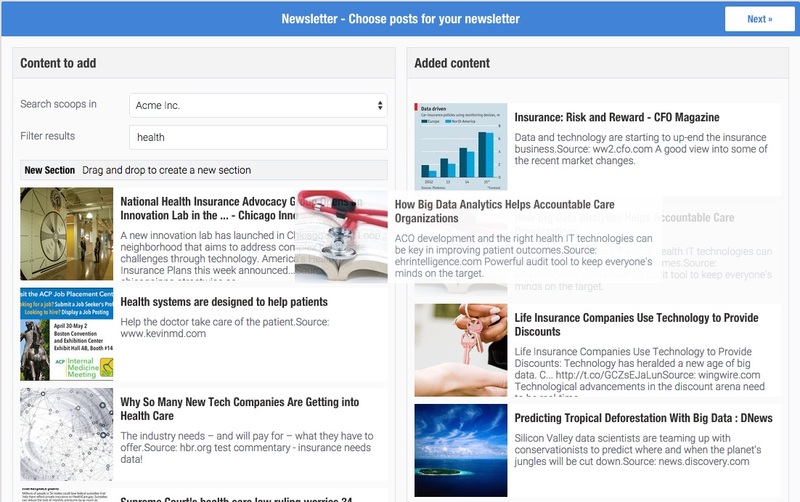 Create an email with the content you’d like them to share. Add simple sharing buttons to each of the posts. Et voila! No more excuses. Time for the whole process: 5’. Results for the whole process: N times more shares, more informed co-workers, more traffic to your blog and a happy content marketer in the company. This is a variant of the above that works for the same reason – for companies that have become addicted to Slack and have started to replace a lot of email this way. Though we still love email, we use Slack ourselves and have tested this method by integrating Scoop.it Content Director account to Slack. We recently started using Zapier, which allows you to easily connect apps that haven’t yet built an integration between themselves. Slack integrates with Zapier, Scoop.it Content Director integrates with Zapier, ergo Slack integrates with Scoop.it Content Director. It will let you choose which Slack channel to post content in and what associated message you’d like to encourage teammates to click on and share. While Slack is all the rage, we found that this method is actually less efficient than email, which is more asynchronous than an IM channel updated in real-time. People can retrieve the email when they want- during their commute for instance – and simply click on the sharing buttons they like, while Slack washes away the posts with follow-on messages. But again, this is a company culture thing and we thought you might enjoy this one too (tip: they’re not mutually exclusive!). How do 5x more shares in a few weeks sound? 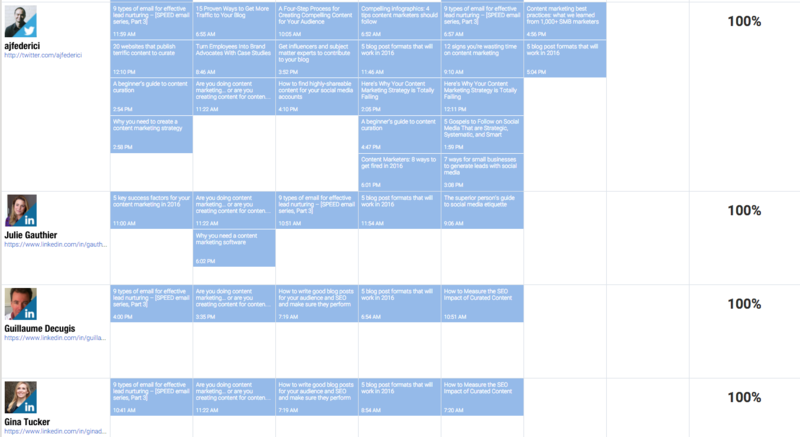 Content distribution is hard. And it’s getting harder. Luckily you can relieve some of the burden by showing your co-workers just how easy it is to share your content. You’ll see a significant increase in social distribution and reach while educating and informing them in the process. 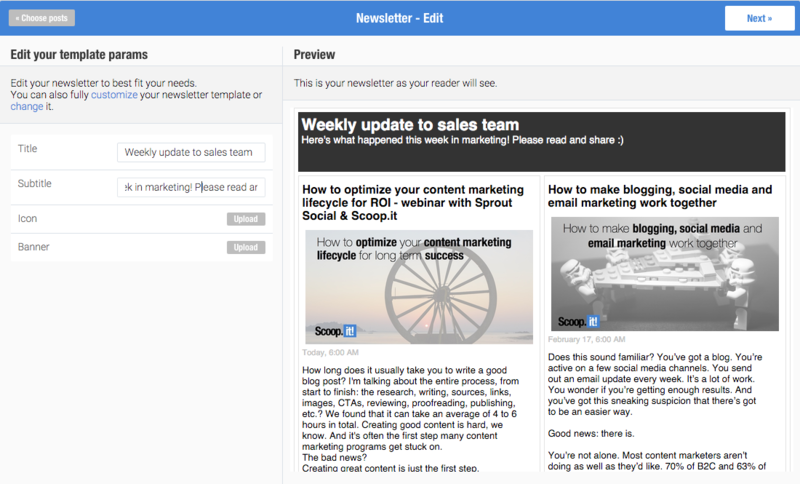 You’ll also receive valuable feedback on your content and be more in sync with the rest of the company. Have you tried any of the above pragmatic methods? What results did you get?